It's a heated discussion about Presidential Candidate Barry Goldwater with guests Jackie Robinson, Shelley Winters and William F. Buckley Jr. The program is interrupted for 8 minutes by an ABC News Bulletin from the White House. President Lyndon B. Johnson talks to the American People concerning the Gulf of Tonkin attack and USA intervention. Prior to resuming "The Les Crane Show," the network plays "The National Anthem," a patriotic gesture of the era. American morality is changing, especially among the young. Is the trend toward pleasure and kicks for kicks sake? Among those interviewed: Timothy Leary, Ralph Ginzburg, Ray Anthony, Jonathan Miller, Hugh Hefner, William F. Buckley Jr., and Dr. Harvey Cox discuss freedom in society without destroying itself. #1028: FIRING LINE WITH WILLIAM F. BUCKLEY JR.
Groucho Marx, William F. Buckley Jr. Firing Line was an American public affairs program hosted by William F. Buckley Jr. Its 1504 episodes over 33 years, made Firing Line the longest-running public affairs show in television history with a single host. Humor and the Marx wit predominate as guest Groucho Marx trades ad-libs with host William F. Buckley. Woody Allen's guests for this humorous retrospective of the year 1967 are Liza Minnelli, Aretha Franklin, John Byner and William F. Buckley Jr.
#1058: FIRING LINE WITH WILLIAM F. BUCKLEY JR.
Dethroned heavyweight champion Muhammad Ali joins host William F. Buckley Jr. for a wide-ranging talk session. Tom Snyder, William F. Buckley Jr.
#8146: FIRING LINE WITH WILLIAM F. BUCKLEY JR. Firing Line was an American public affairs program hosted by William F. Buckley, Jr. Its 1504 episodes over 33 years, made Firing Line the longest-running public affairs show in television history with a single host. William F. Buckley interviews Russian novelist and historian Alexander Solzhenitsyn from the United Kingdom. 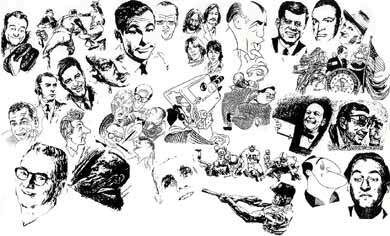 Art Buchwald, Bob McFadden, George S. Irving, David Frost, Jack Burns, Avery Schreiber, William F. Buckley Jr.
A satirical review of 1972. Jack Burns and Avery Schreiber are the hosts; guests include William F. Buckley Jr., David Frost, Art Buchwald, George S. Irving and Bob McFadden.